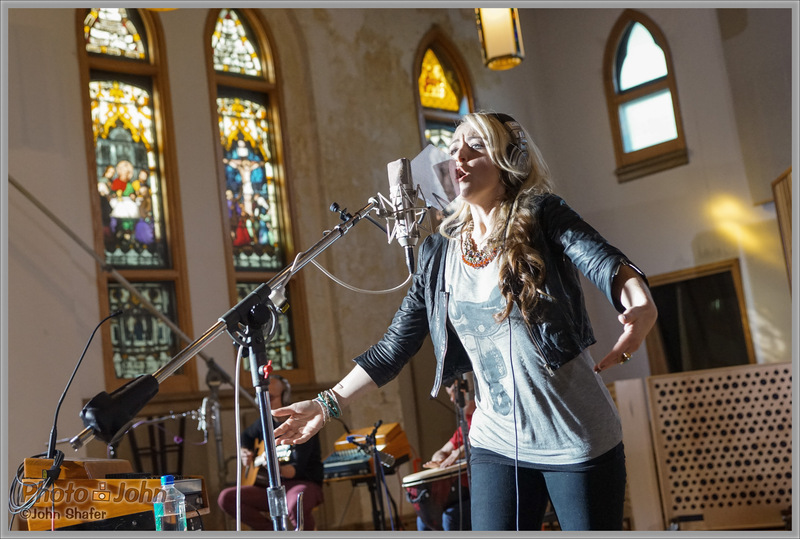 Last week I, and a bunch of fellow camera journalists, spent a few days in Nashville testing Sony’s new full-frame mirrorless cameras, the Alpha A7 and A7R. These ground-breaking cameras were only announced a few weeks ago and aren’t even available yet so this was a very cool opportunity. They are, for the most part, the same camera, with same compact weatherproof body and features, including built-in Wi-Fi, full HD 60p video, customizable function buttons, an excellent electronic viewfinder and a tilting LCD display. The key difference between the two cameras is the sensor. The A7 uses the 24-megapixel full-frame sensor that was used in Sony’s A99 flagship DSLR. 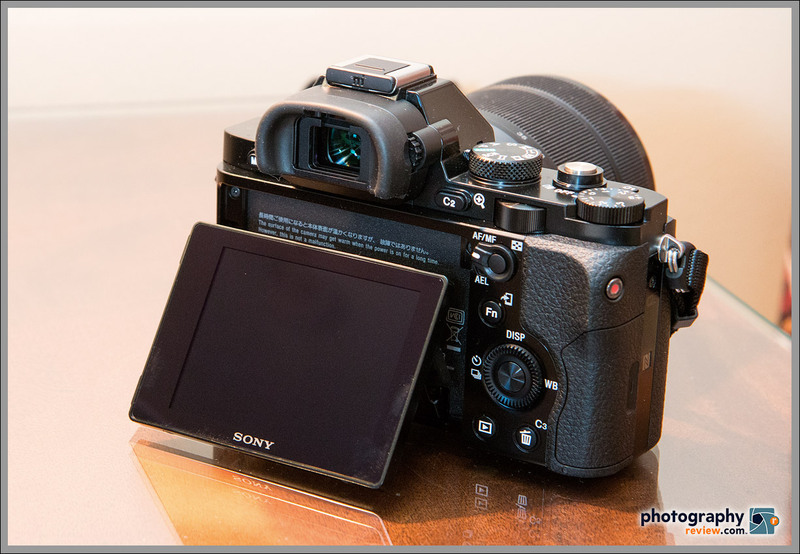 The A7R, on the other hand, gets a 36-megapixel full-frame sensor with no anti-aliasing (AA) filter. Both cameras provide full-frame image quality in a much smaller, easier to carry and less intrusive package than a full-frame digital SLR. Lab testers, DxO Mark, have already proclaimed the 36-megapixel A7R sensor one of the best they’ve ever tested – beating out the Nikon D800 (see our Nikon D800 studio sample photos) and coming in just a hair behind the D800E, which also has an AA-free version of the D800 sensor. It’s well-known that the Nikon D800’s 36-megapixel full-frame sensor was sourced from Sony and A7R sensor is clearly a massaged update of what Nikon used. Sony gave us a presentation about what they’ve done to improve the sensor. Besides the obvious – removing the anti-aliasing filter – they also gave it new micro lenses, adjusted the positioning of the individual pixels, and there’s also a new BIONZ X image processor, which helps improve fine details, minimize noise and minimize diffraction in images where the lens is stopped down. 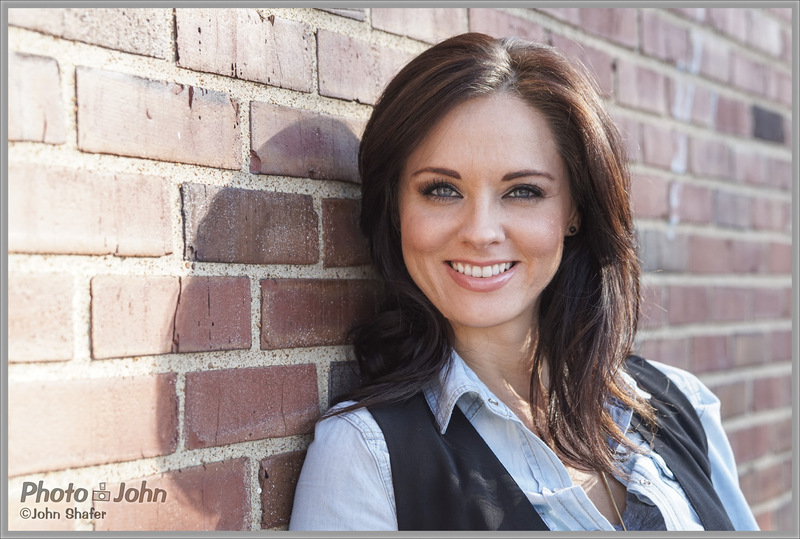 I shot this model on the roof of a recording studio in Nashville with the Sony Alpha A7R and 24-70mm f/2.8 Zeiss A-mount lens (with an adapter). This photo is a good example of how scary sharp and detailed the A7R photos can be. Normally, I'd run a bit of portrait software on an image like this because it really shows too much. But for testing purposes I've left it alone. This was shot at ISO 1600 with the Sony Alpha A7R and 24-70mm f/2.8 A-mount lens (via an adapter) and then converted to B&W in Lightroom. 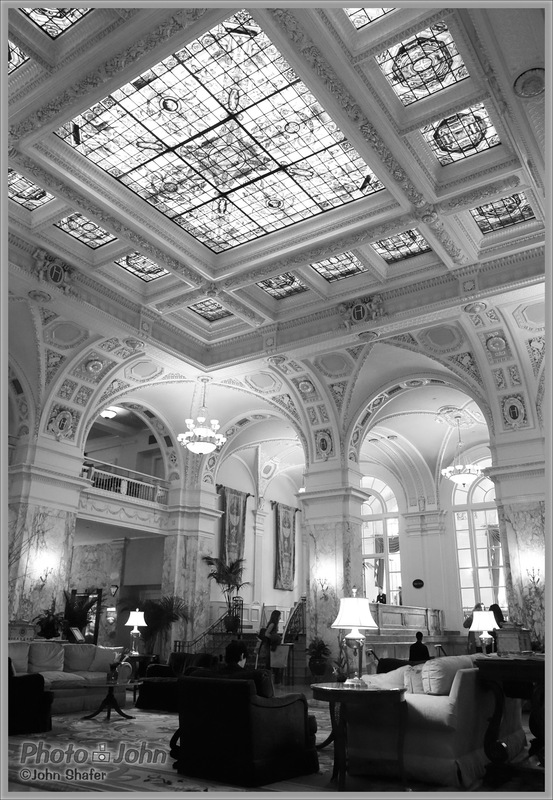 The lobby of the fabulous Hermitage Hotel in Nashville, Tennessee. Taken with the Sony Alpha A7R and 24-70mm f/2.8 A-mount Zeiss lens (via an adapter) at ISO 6400 and then pushed about a stop more in Lightroom. 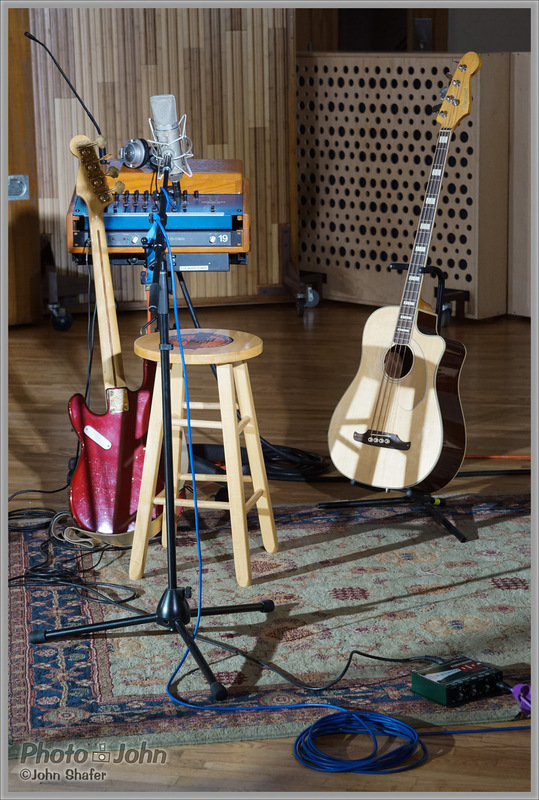 Photographed in historic RCA Studio A in Nashville, which is now owned by musician Ben Folds. The light was very poor in the studio and this was shot at ISO 6400 with the Sony Alpha A7R 36-MP full-frame mirrorless camera. Looking down on Music Row in Nashville, with the AT&T building in the background. This was shot with Sony's new 36-megapixel full-frame Alpha A7R mirrorless camera at ISO 6400. There are display cases throughout the Ryman Auditorium in Nashville, showing off relics from the old Opry days. 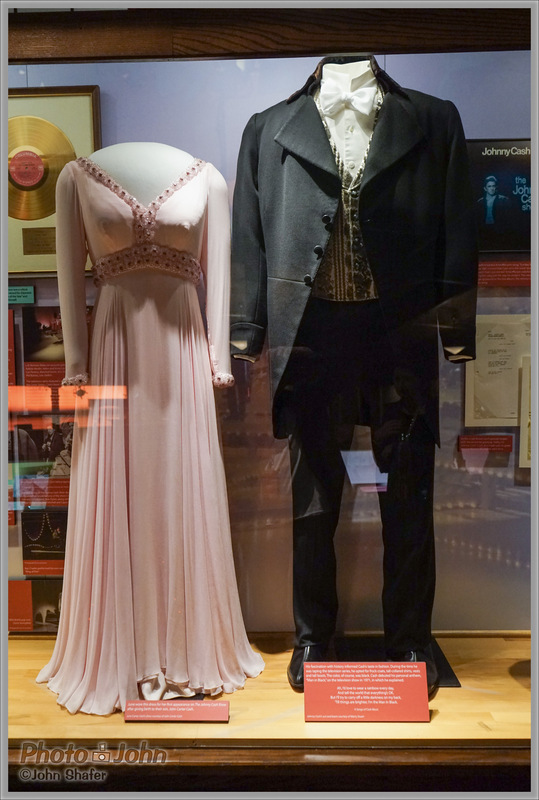 This photo of June Carter's dress and Johnny Cash's suit was shot at ISO 3200 with the Sony Alpha A7R and the A-mount 24-70mm f/2.8 Zeiss lens, mounted with an adapter. There are display cases throughout the Ryman Auditorium in Nashville, showing off relics from the old Opry days. 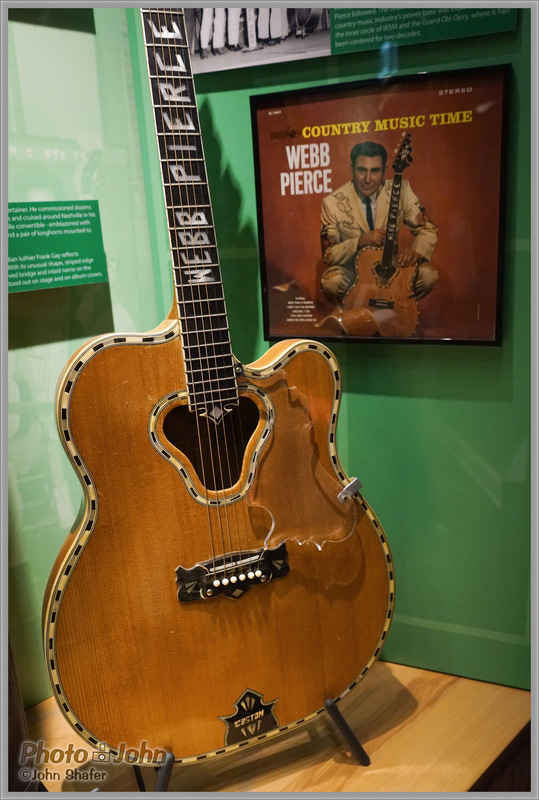 This photo of Web Pierce's guitar was shot at ISO 3200 with the Sony Alpha A7R and the A-mount 24-70mm f/2.8 Zeiss lens, mounted with an adapter. Sony Alpha A7R - Too Much Detail? 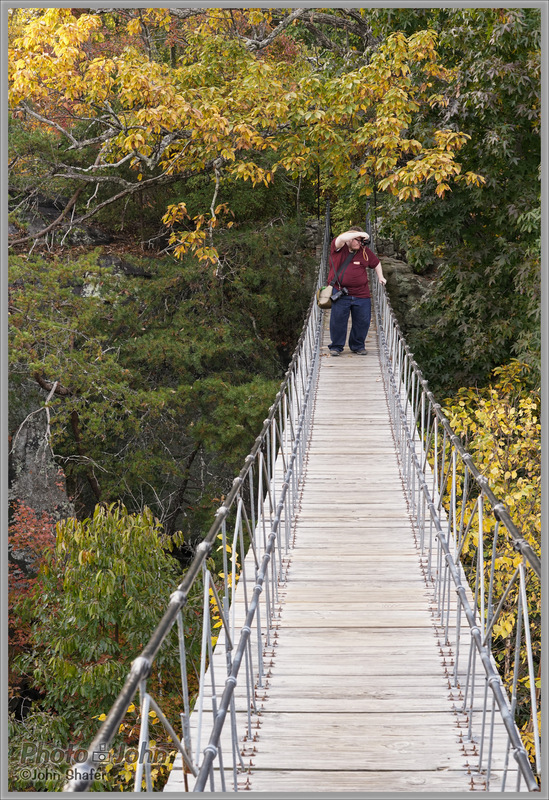 This photo is a good example of why you need to be careful with the A7R. The 36-megapixel sensor is so sharp and captures so much detail that it will show up every flaw in a subject's skin. This model is really beautiful but her skin is a little rough. 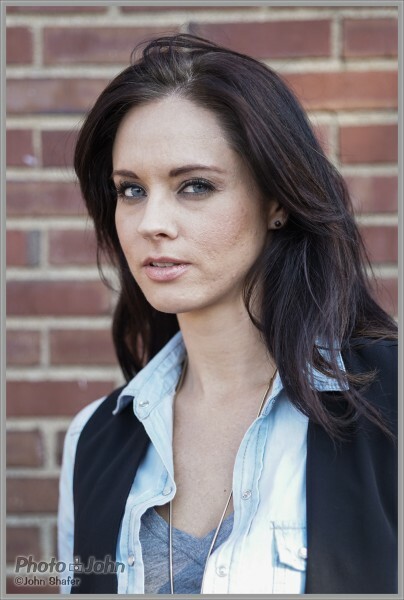 So you might not want to photograph your wife or girlfriend with the A7R. Or if you do, you should run a little portrait software on the images before you show them off. With great resolution comes great responsibility! There are display cases throughout the Ryman Auditorium in Nashville, showing off relics from the old Opry days. 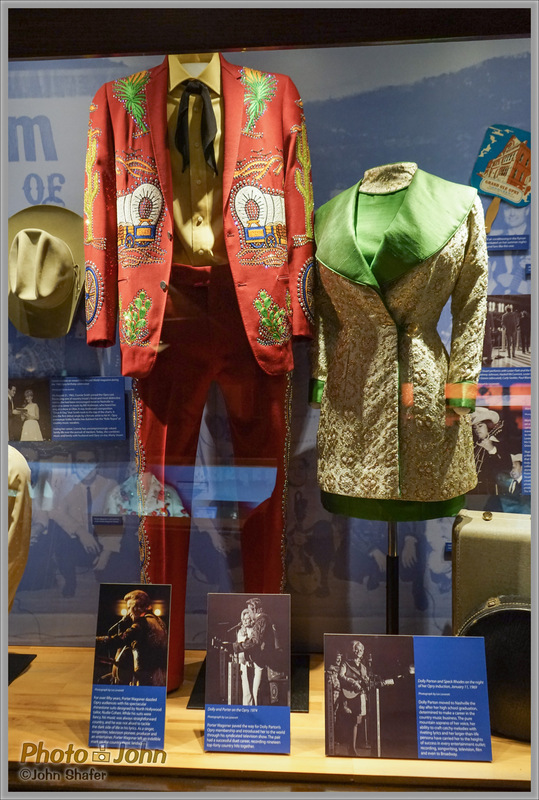 This photo of Porter Wagoner's Nudie suit and Dolly Parton's dress was shot at ISO 3200 with the Sony Alpha A7R and the A-mount 24-70mm f/2.8 Zeiss lens, mounted with an adapter. 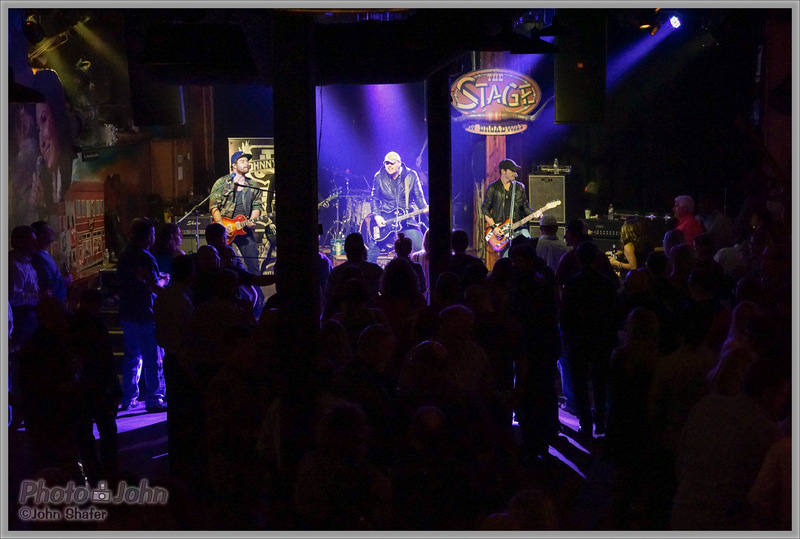 Local Nashville country band Johnny T, playing at The Stage, on Nashville's Music Row. This was taken with the new Sony Alpha A7R full-frame mirrorless camera at ISO 6400. 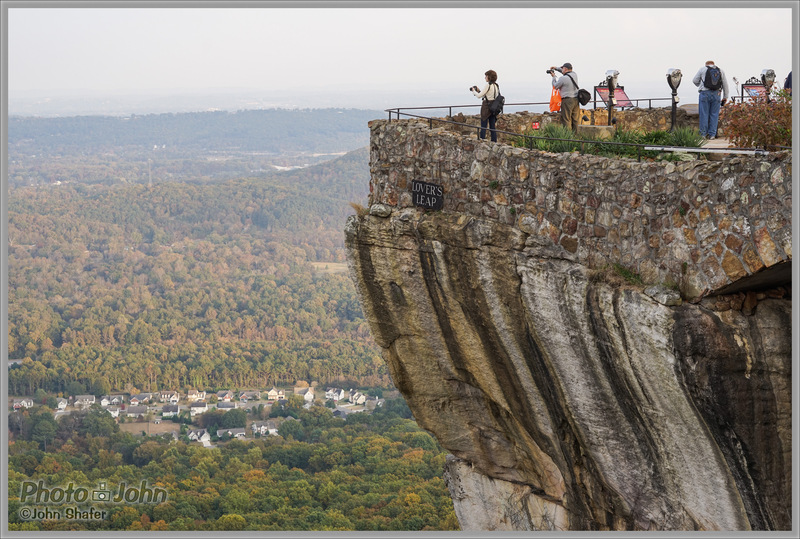 Lover's Leap at Rock City, Georgia, taken with the Sony Alpha A7R and A-mount 50mm f/1.4 lens (mounted with adapter) at ISO 100. The level of detail possible with the A7R is pretty incredible. 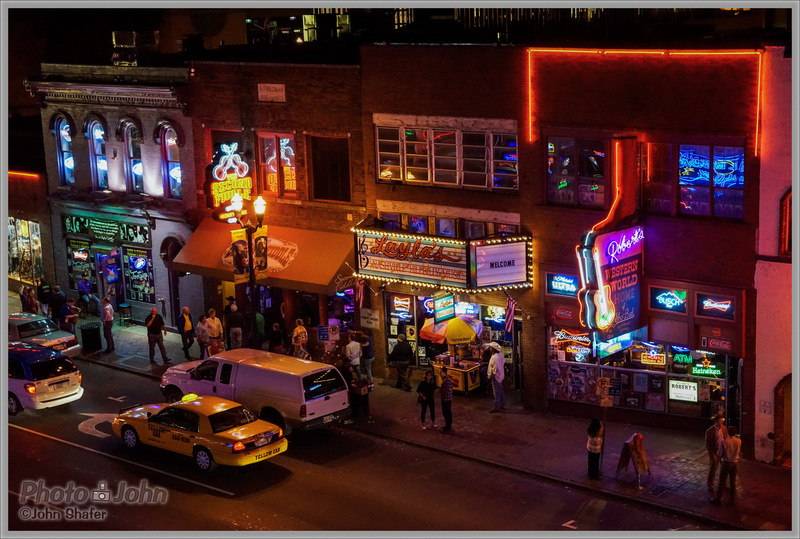 The neon lights of Nashville's Music Row, shot from a rooftop with the Sony Alpha A7R at ISO 6400. 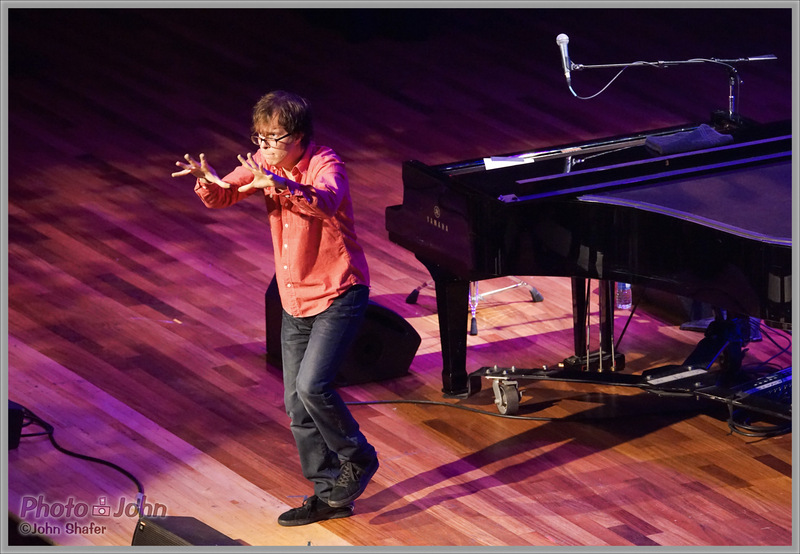 Ben Folds, directing the audience at a concert at Ryman Auditorium in Nashville. This was shot at ISO 6400 with Sony's 36-MP full-frame A7R mirrorless camera and the A-mount 80-400mm zoom (via the LA-EA3 adapter). Taken at the Ryman Auditorium in Nashville, TN. 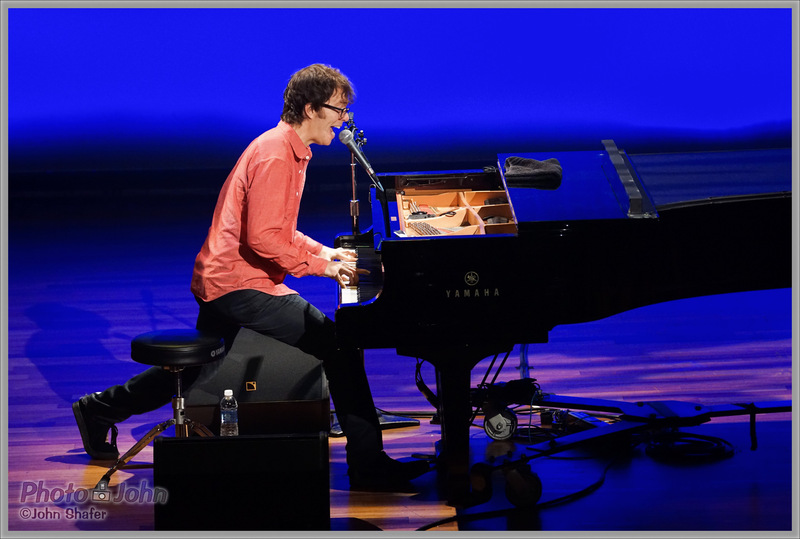 This photo of Ben Folds' sound check was taken with the Sony Alpha A7R and then transferred to my phone via the camera's built-in Wi-Fi. Then I processed it in Snapseed and posted it straight to Instagram. 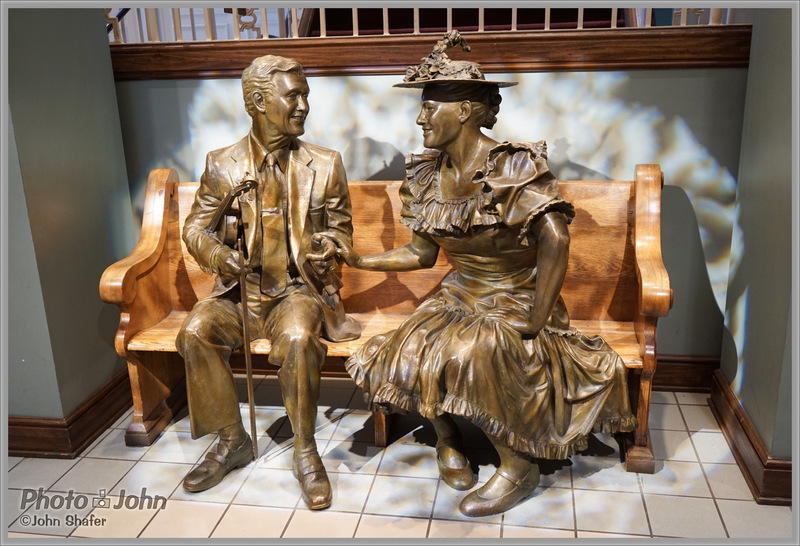 Bronze sculpture in the lobby of the old Ryman Auditorium in Nashville, TN, the original home of the Grand Ole Opry. 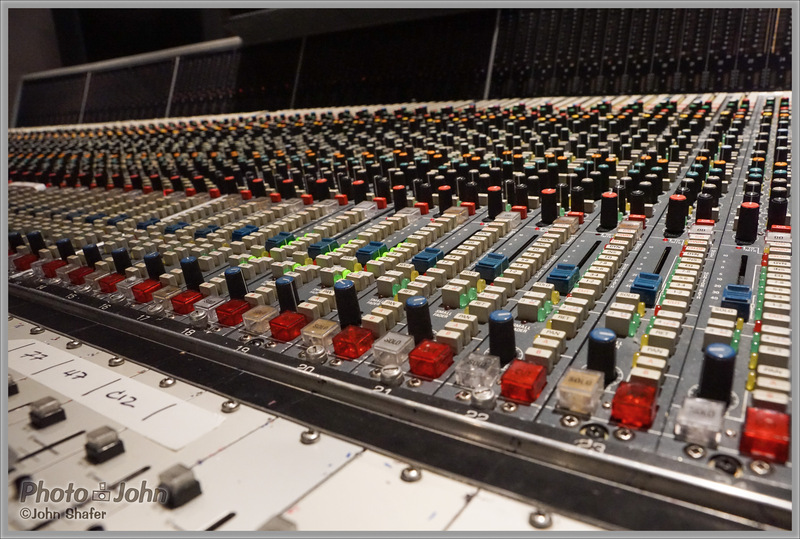 Photographed in historic RCA Studio A in Nashville, which is now owned by musician Ben Folds. The light was very poor in the studio and this was shot at ISO 12,800 with the Sony Alpha A7R 36-MP full-frame mirrorless camera. 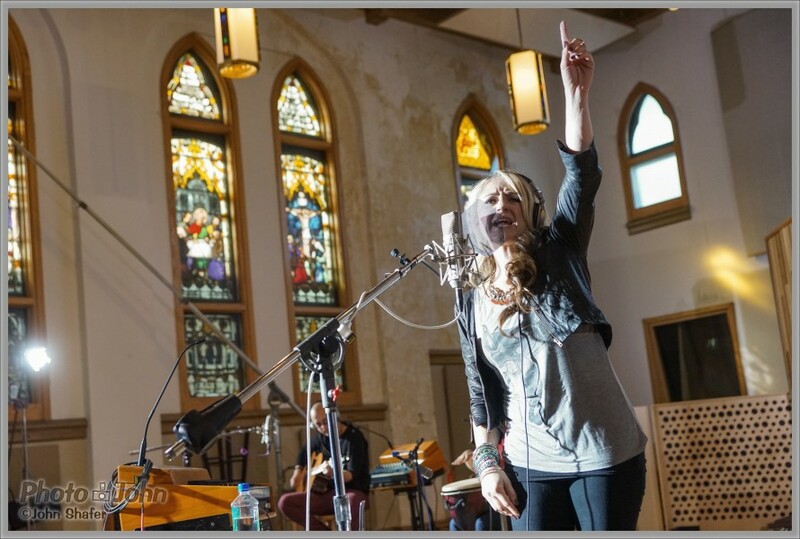 Sony country artist Leah Turner, during a private studio performance. This was taken with the Sony Alpha A7R at ISO 2500. 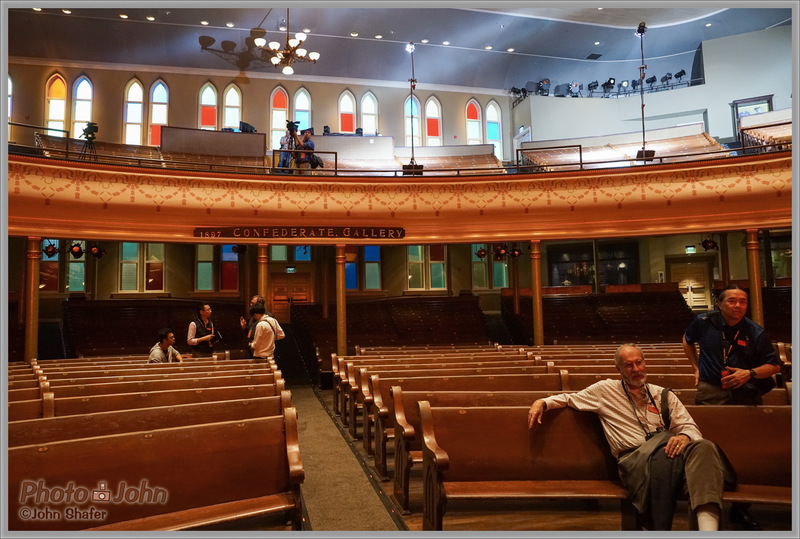 Looking out into the seats - church pews - in the Ryman Auditorium, original home of the Grand Ole Opry. This was taken at ISO 6400 with the Sony Alpha A7R. 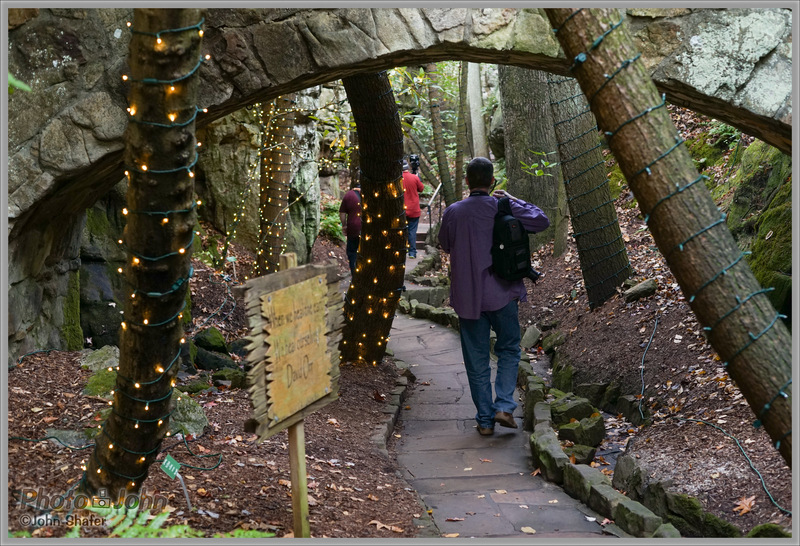 If you take a close look at this image you'll see that even at ISO 1600, the Sony Alpha A7R is retains tons of detail. This reminds me of ISO 100 from just a few years ago. 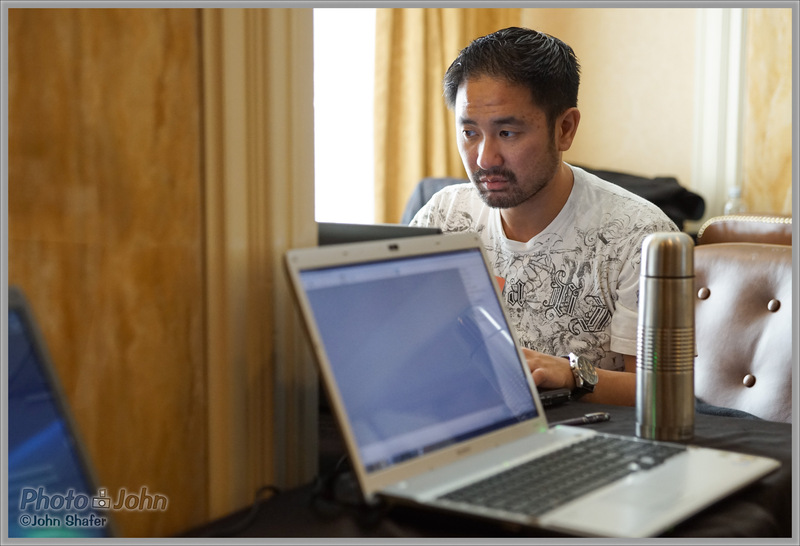 Photographer Joe Gunawan, working in the lab at our hotel in Nashville. This was taken at ISO 1600 with the Sony Alpha A7R and 24-70mm f/2.8 A-mount lens, mounted with an adapter. 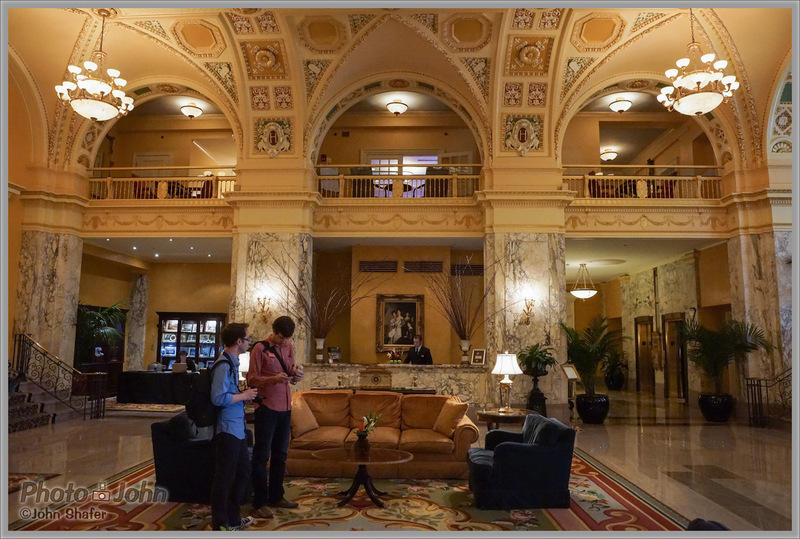 This was taken at ISO 6400 in the Hermitage Hotel lobby in Nashville. It was converted to black-and-white in Lightroom. Taken at ISO 640 with the Sony Alpha A7R and 50mm f/1.4 A-mount DSLR lens, mounted with an adapter. Two test prints made from Sony Alpha A7R image files. They're both 8.5x11 crops from 24x36-inch enlargements, a 50% increase from the native file size. The print on the left is from an ISO 100 file and the print on the right from an ISO 6400 file. I’m not going to get too deep into image quality analysis in this article. I’ll just let the sample images speak for themselves. Obviously, I wasn’t using the A7R in a lab and there’s no Lightroom support yet so I haven’t been able to look at the RAW files. 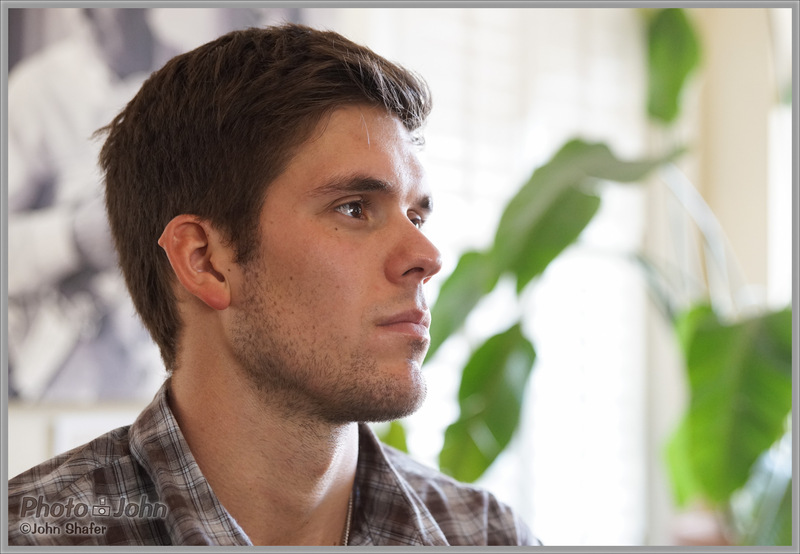 I am very impressed with the image quality in the photos I shot with the A7R, though. At low ISO settings the sharpness and detail are dangerous. That’s right – I said, dangerous. I recommend you don’t use the A7R to take pictures of your wife unless she has absolutely flawless skin. This camera will get you in trouble. Check out the photo of the model below to see what I mean. She’s a beautiful woman with great eyes but her skin is a little rough and the camera captures that detail all too well. There’s nothing wrong with using the A7R for portraits. Just be aware that you might need to apply some portrait filters in post because the sensor captures every pore and blemish. Personally, I think the A7R’s small body and big image quality make it perfect for landscape, travel and low light event photography. I didn’t get to do a lot of landscape work with it but in the photos I did take the unfiltered 36-megapixel sensor captured every leaf, twig and pebble with outstanding detail. The native print size of an uncropped A7R file is about 16 x 24 inches at 300 dpi. So at low ISO’s you could make really huge prints from the A7R files. And even at ISO 1600 detail is very impressive. I actually made some test prints to see what was possible – but more on that, later. Using the A7R in low light was the most impressive thing for me – it’s absolutely solid right up to ISO 6400. To maximize image quality, I paired the camera with Sony’s excellent 24-70mm f/2.8 A-mount Zeiss zoom lens, via the LA-EA3 adapter. Since neither the body nor the lens have image stabilization, I did lose some photos to camera shake. The auto focus with the LA-EA3 was also very slow so I either had to be patient or switch to manual focus. Unfortunately, I also lost a bunch of manual focus photos because the focus peaking wasn’t working right. I wasn’t the only journalist who noticed the problem so it wasn’t just me, either. I’ll chock that up to using an early version of the camera. Hopefully they’ll have it all sorted out in when the camera ships. 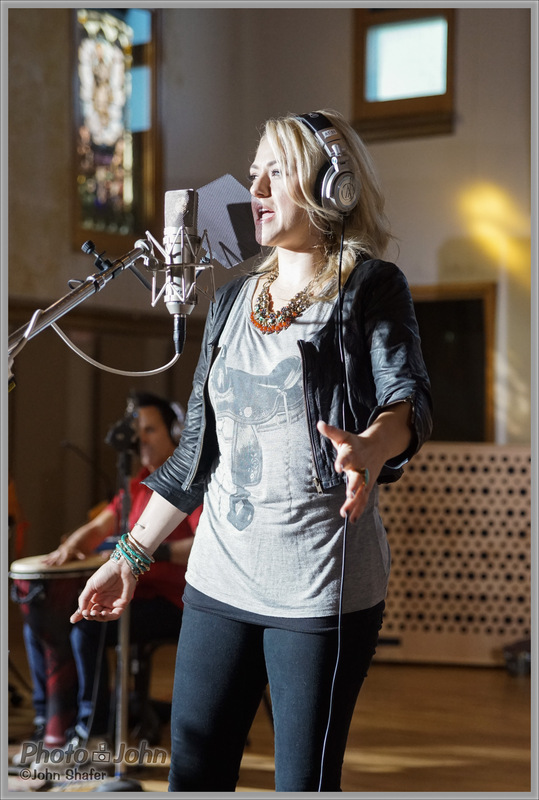 My first real test of the A7R’s low light ability was shooting a live performance of Sony recording artist Leah Turner in a music studio. They had some continuous lighting set up for us and there was window light, but she was moving a lot and it was still pretty dim for a camera sensor. 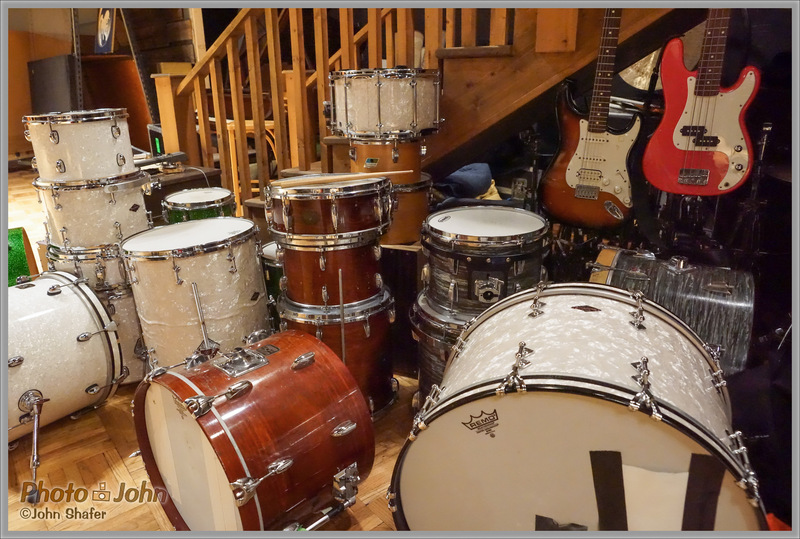 Most of my photos in the studio were shot at ISO 2500 with an aperture of f/3.2 at 1/1000th of a second. The high ISO and fast shutter speed ensured I didn’t have any motion blur or miss any of the action. However, the auto focus with the 24-70mm Zeiss lens and LA-EA3 adapter wasn’t able to lock on with all the movement so I switched to manual focus with focus peaking. That’s when encountered the aforementioned focus peaking problems. Luckily, I did manage to get a few good, sharp images (below). Take a close look at these and I think you’ll be impressed at how detailed they are – especially if you look at her eyes and hair. I’m not at all used to seeing this kind of detail at sensitivity settings about ISO 1600. 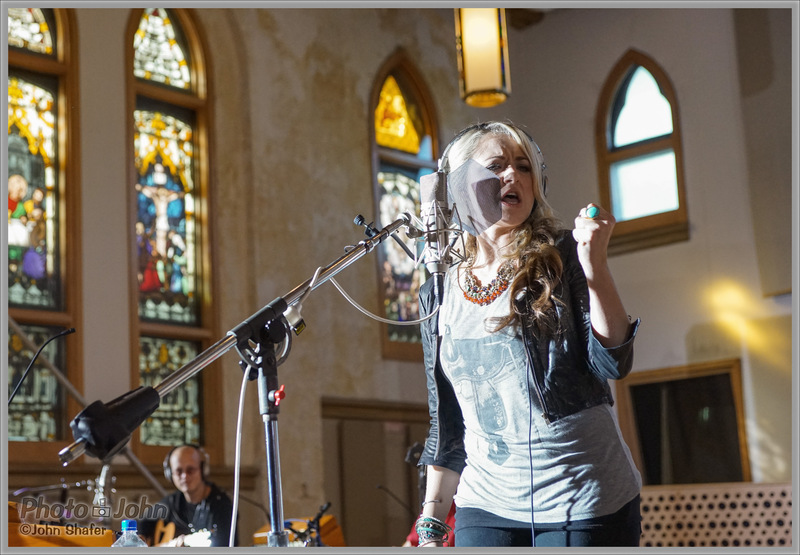 Later we got to shoot a proper concert at the Ryman Auditorium, otherwise known as the Mother Church of Country Music. 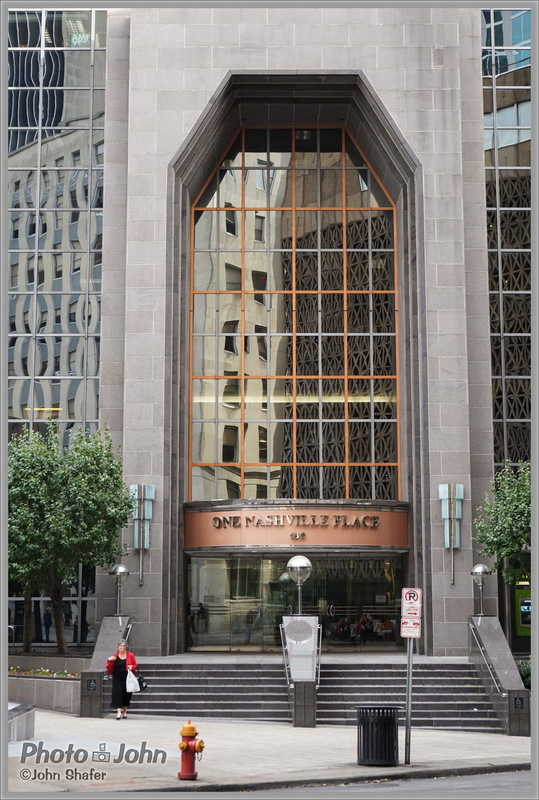 It’s also the original home of the Grand Ole Opry and it was an honor just to be there, where Hank Williams, Johnny Cash, Patsy Cline and so many other great country musicians have lived and performed. It’s truly hallowed ground. 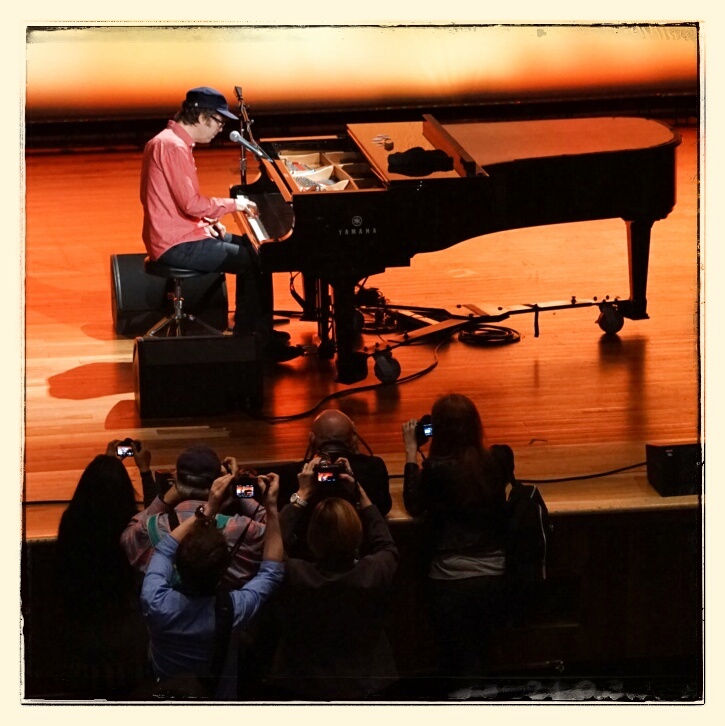 Sony set up a special concert for us, in the Ryman, with singer-songwriter Ben Folds. It was a full house thanks the Ben Folds fan club and some last minute radio promotions. But the camera journalists, myself included, got the run of the house – something that almost never happens – even when you’re a full-time working concert photographer. It was a real treat. Great low light camera performance makes a huge difference for shooting concerts. I was able to shoot down front with the 24-70mm f/2.8 Zeiss zoom, but my favorite photos were all shot from the balcony with Sony’s excellent A-mount 70-400mm f/4-5.6 G zoom mounted with the LA-EA3 adapter. It’s not a fast lens. But the optics are very good and the zoom range is excellent. The first photo below, of Ben rocking out at the piano, was shot at ISO 4000 and it looks great. 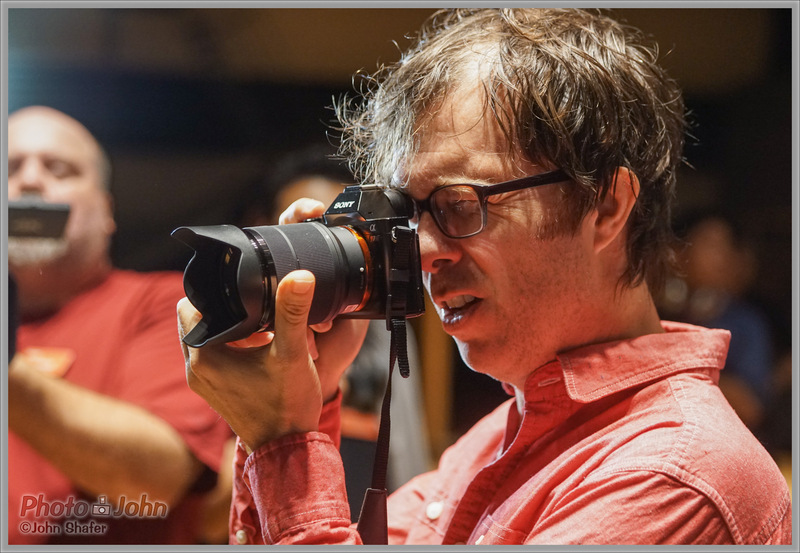 The photo of Ben Folds directing the audience was taken at ISO 6400. It has a pretty significant crop and it still looks good. It would have been nice to have a faster telephoto with some image stabilization. But I think I did pretty good, considering. Hopefully, Sony has some long fast OSS (Sony’s optical image stabilization system) lenses in the works for the Alpha mirrorless cameras because with the right lenses, the A7R will be one hell of a concert camera. After the concert we went out to a club on Nashville’s famous Music Row, where I was able to shoot some more live music, followed by some photos of the neon lights. If you’ve never visited Nashville, I highly recommend it. I’d never been there before and I feel like I didn’t even scratch the surface of photographic possibilities. Music Row alone is a goldmine of photo opportunities. There’s no doubt about it, the Sony A7R image quality is excellent. But just to be sure, I made a couple of prints. Pixel-peeping really isn’t the best way to evaluate image quality since it doesn’t account for resolution and an image that looks soft and blurry at 100% on the computer screen might actually print quite well. 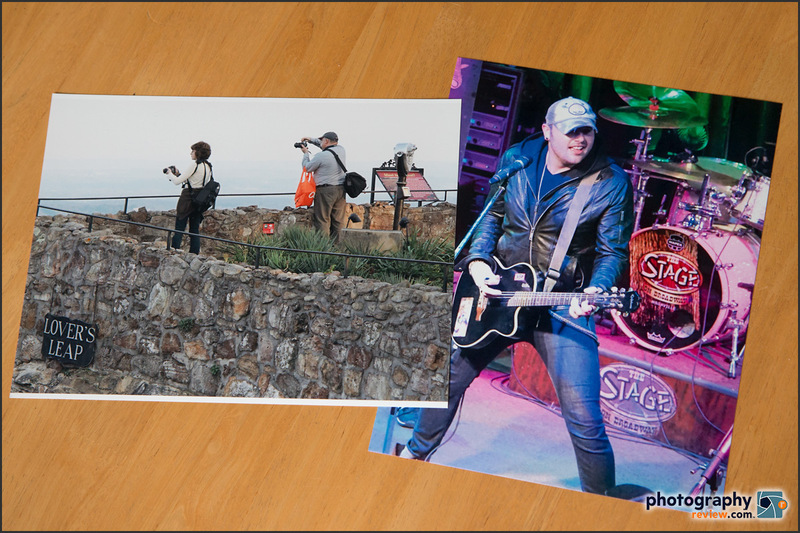 I made two prints – one from the ISO 100 Lover’s Leap image above; and one from one of the ISO 6400 Johnny T band shots. For both prints I enlarged the original files to 24×36 inches with no interpolation and then cropped out an 8.5×11 section (that’s the largest print my printer can make). That meant I printed at about 200 dpi instead of the standard 300 dpi. No sharpening or noise reduction were used, either. The point was to find out what the A7R files are capable of on their own, with no expert post-processing magic. I thought the prints looked great. The Lover’s Leap image looked nearly perfect and could be enlarged a lot more, in my opinion. 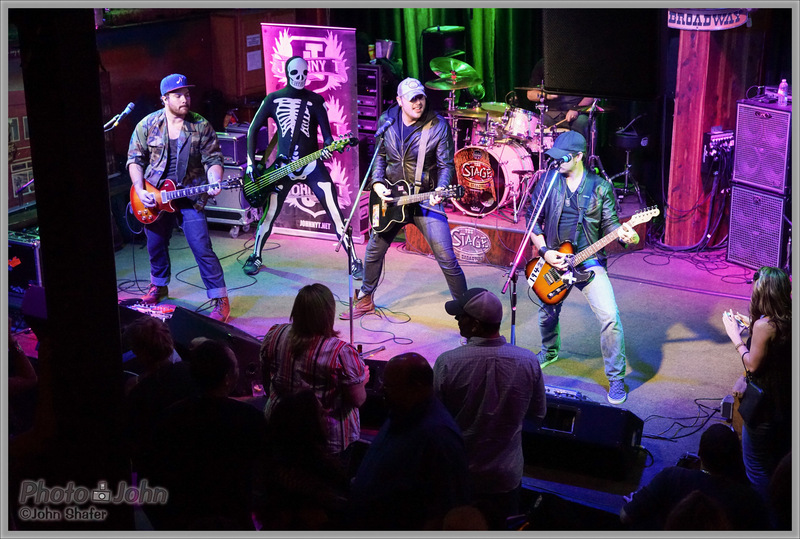 The band photo was a tad soft, but for an ISO 6400 photo enlarged to 24×36 inches, I think it’s excellent – especially when viewed from a normal distance for a 24×36-inch print (“normal” viewing distance is 2x the diagonal measure of a print). And if I was really serious about making good prints and not just testing for image quality, I could make these look even better. It looks like Sony has a winner on their hands as far as image quality goes. But camera features and handling matter, too. One of the main selling points of the A7R is exceptional image quality in a very small, light camera. That won’t matter if the controls are awkward or buried in menus. Luckily, that is not the case. Even though the A7R is small, Sony made sure it had the kind of dedicated, easily accessible controls that serious photographers demand. On the top right deck of the camera you’ll find a mode dial and a dedicated exposure compensation dial. And just in front and back of the right side of the top deck there are separate exposure control dials for aperture and shutter speed. 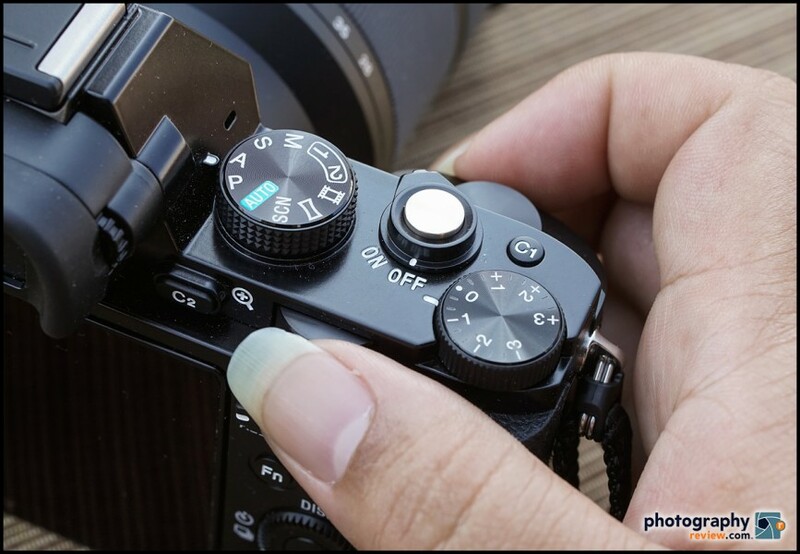 The A7R also has multiple customizable buttons and the exposure control dials can be programmed to your own tastes. I found the camera to be pretty intuitive and it handled quite well – even with large, heavy lenses. It feels solid and it’s even weather-sealed. Even though it’s a whole lot smaller and lighter, the A7R performance and controls are pretty much on par with full-frame DSLRs. Honestly, unless you’re a sports photographer who needs super-snappy auto focus and a fast frame rate, I don’t see why anyone wouldn’t choose the A7R over a bigger, heavier DSLR. I won’t go into it too deeply, but one feature I really enjoyed on the A7R was the built-in Wi-Fi. When you have Sony’s free PlayMemories Mobile app installed on your Smart Phone or tablet, you can use the camera’s built-in Wi-Fi to wirelessly transfer photos and videos to your mobile device. 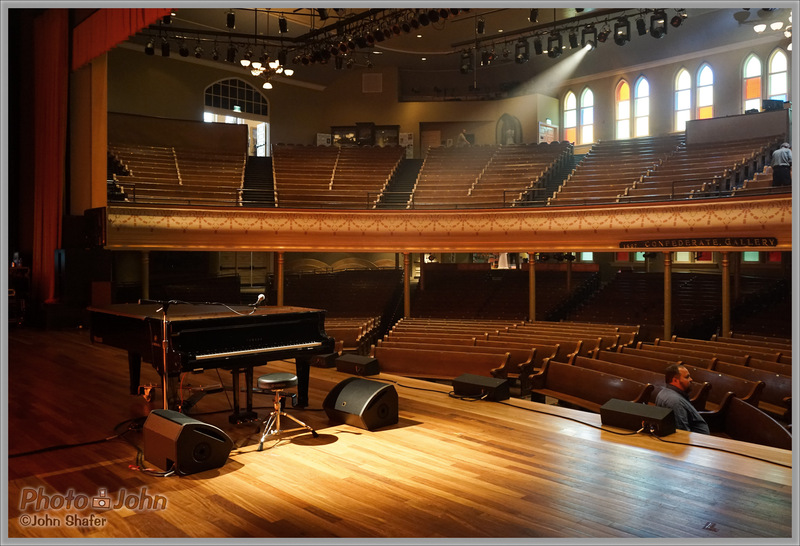 For me, that meant I was able to post my A7R photos right to Instagram and Facebook during our tour of the Ryman Auditorium, as well as during the concert. I transferred the photos to my phone, processed them with Snapseed, and then uploaded them with the Instagram app on my phone. If you’re an event shooter or a professional photographer who uses social media, the built-in Wi-Fi is invaluable. No more posting mediocre camera phone photos – just the good stuff that you shot with a real camera. There are few apparent downsides to the A7R. One of the most important is the current lack of lenses. Sony does have a very aggressive lens rollout schedule planned for the A-series mirrorless cameras, though. If I remember right, they plan to have something like 15 lenses available by the end of 2015. Right now there’s a 28-70mm f/3.5-5.6 OSS zoom (the A7 kit lens), two Carl Zeiss primes, a 35mm f/2.8 and a 55mm f/1.8; and a 24-70mm f/4 OSS Carl Zeiss zoom, which they didn’t have for us at the press event in Nashville. My choice to use the A-mount lenses with the LA-EA3 adapter was made mostly for image quality and, as I mentioned, I ended up having some focus issues. I’m not going to blame that on the camera, though, since I was using lenses that weren’t made for it. If you do plan to use Sony’s A-mount DSLR lenses with the A7R, I highly recommend you pony up for the LA-EA4 adapter instead of the less expensive LA-EA3. The LA-EA4 has a built-in transparent mirror with phase detect auto focus so it should give you considerably better auto focus performance than the LA-EA3, which is what I was using when I had focus problems. It’s too bad the 24-70mm f/4 OSS Zeiss zoom wasn’t ready for us because I think I could have avoided all my manual focus problems if it was. Another thing to keep in mind is the A7R image files are huge and require more storage and processing power than what you’d get from most full-frame cameras. The reality is, a 36-megapixel camera is overkill for most photographers. I really consider the A7R a specialty camera for professionals who need maximum resolution and low-light performance. For most of us, the A7 is a much more practical camera – and its 24-megapixel full-frame sensor still delivers excellent image quality. The A7 auto focus is considerably better, too. One of the most important differences between the A7R and the A7 is the A7’s hybrid auto focus, which combines both contrast detect and phase detect systems. 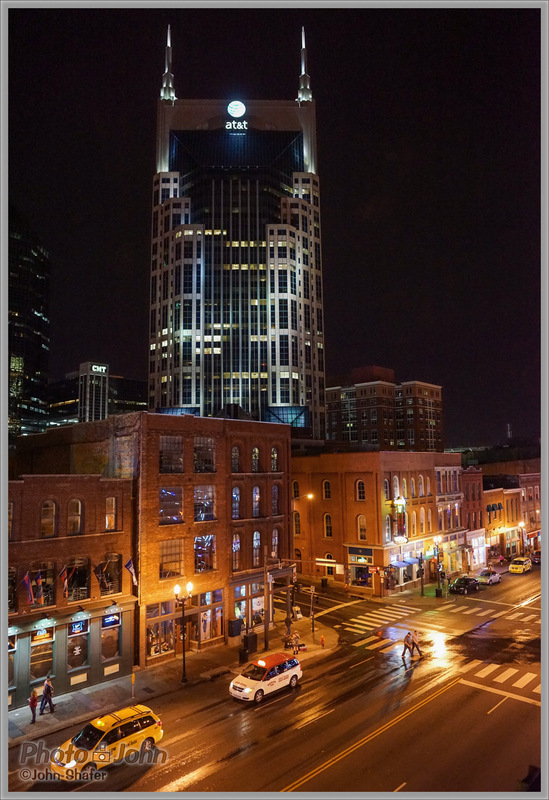 I also used the A7 in Nashville and you can read my Sony A7 first impressions article to find out how it performed. 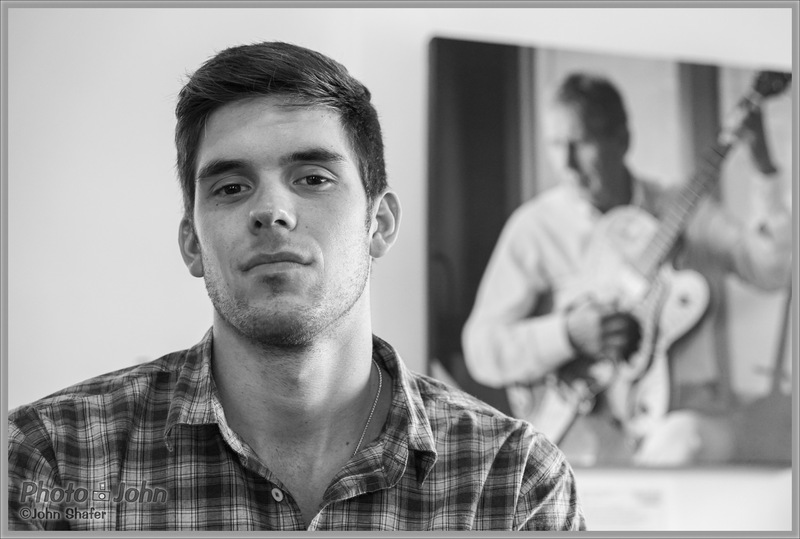 I feel very good about the Sony Alpha A7R after my experience in Nashville. I do need to spend some more time with it before I pass judgment, though. 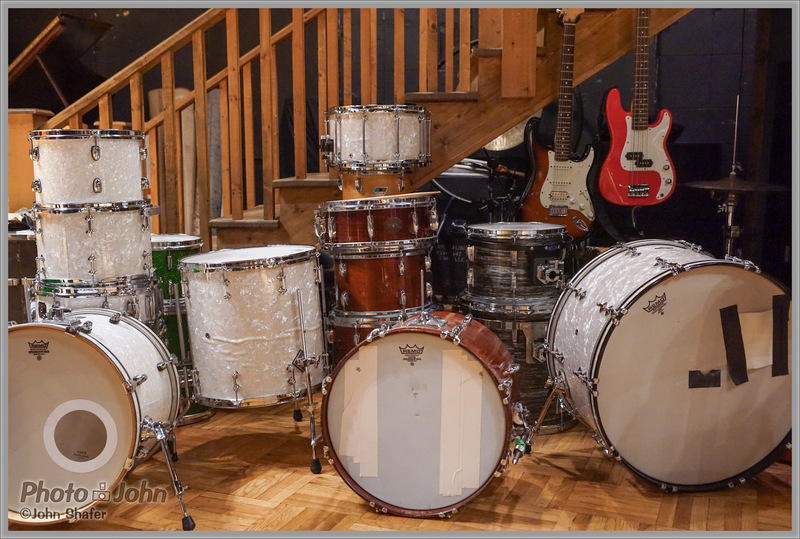 I need to shoot studio tests and get a look at the RAW files. I’d also like to get a better feel for the auto focus and use it with a better-matched lens, preferably the 24-70mm f/4 OSS Zeiss zoom. However, I can comfortably say it’s a great camera. It gives you near DSLR performance and absolutely top-shelf image quality in a truly compact body. It’s amazing really, when you compare it to comparable cameras, which are all fairly hefty DSLRs. The only thing you really give up compared to a DSLR is some burst speed and continuous auto focus performance. Sony really needs to be congratulated on another first with the A7R. If you’re a professional landscape, commercial, or concert photographer and you want the absolute best you can get in a small, light camera, the A7R is it. To see all the sample photos, please continue to the gallery on the next page. 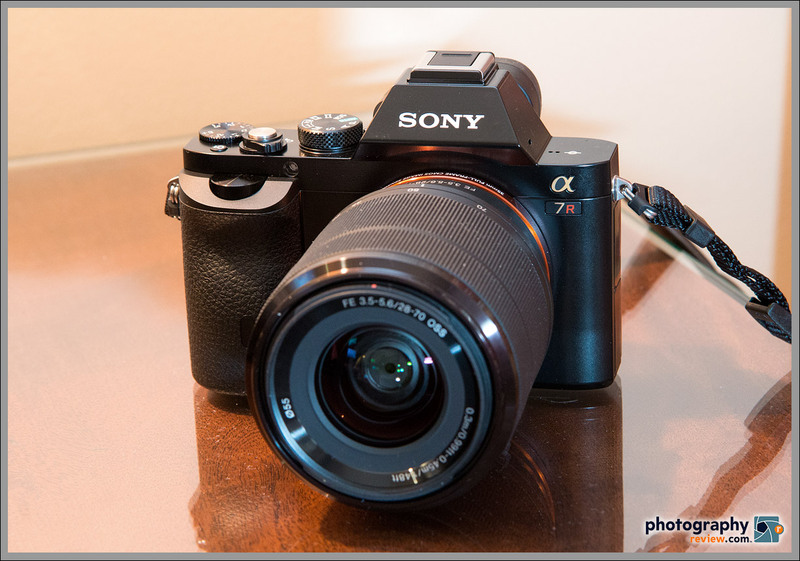 For complete specs and details on the camera, please visit our Sony Alpha A7 & A7R announcement page. Olympus E-PL1 Digital Camera - Costs Less, Has Flash! Convert the a7 RAW files with the latest Adobe DNG converter then open and process in Lightroom.